Early voting is in full swing and Texans are showing up at the polls to exercise their precious right to vote. Austinites have a petty long ballot to vote on and we know it can be difficult to get educated on all of the races. Local leadership is critical for advancing the use of solar energy and addressing climate change though. 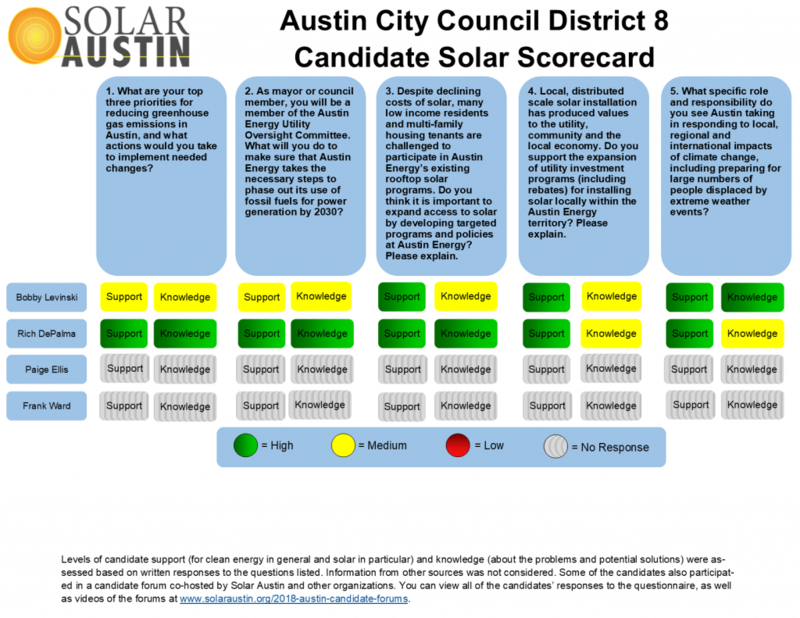 Climate change and energy issues aren’t often front and center in campaigns, so we worked with our partners at Earth Day ATX, Shades of Green and 350 Austin to develop a climate and energy questionnaire for the Austin mayoral and city council candidates. Candidates were scored based solely on their written responses to the questionnaire. 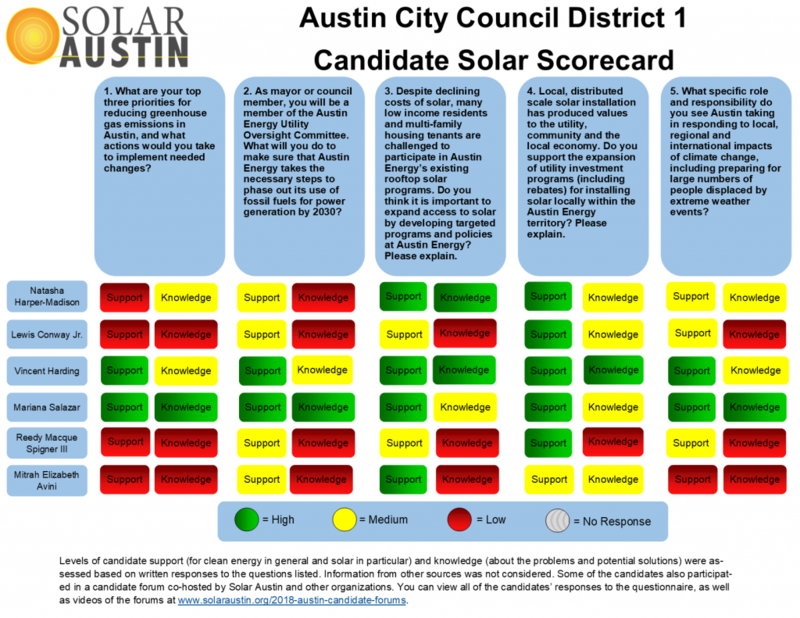 Responses to questions asked at the candidate forums Solar Austin co-hosted, and other information (from candidate websites, for example), was not factored in. 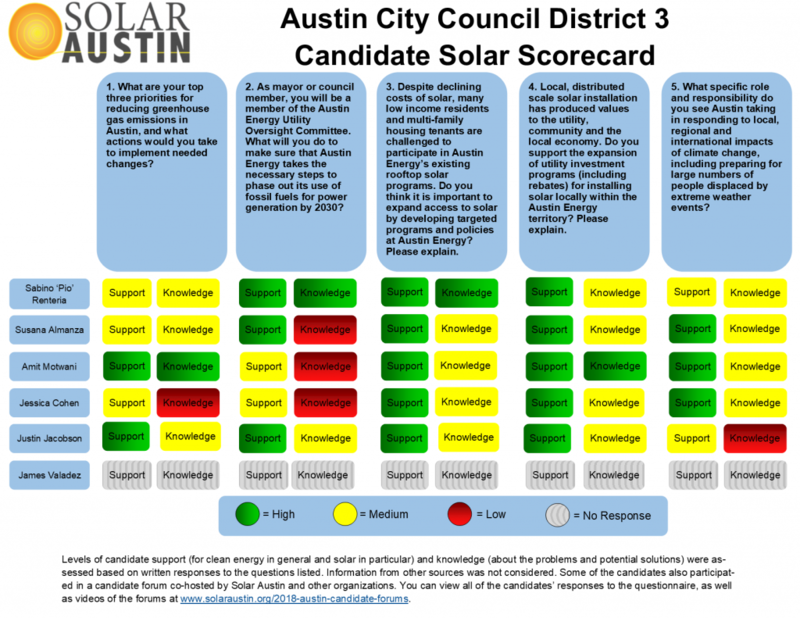 Solar Austin is not endorsing specific candidates, but we do encourage all Austin voters to keep support for clean energy – especially solar – in mind when voting. Don’t forget that city elections are non-partisan, so voting “straight ticket” won’t cast a vote in the mayoral or city council races. Keep clicking through and vote all the way down the ballot. Many important decisions are made at the local level. In order to participate in the forums, candidates were required to respond to a written questionnaire. 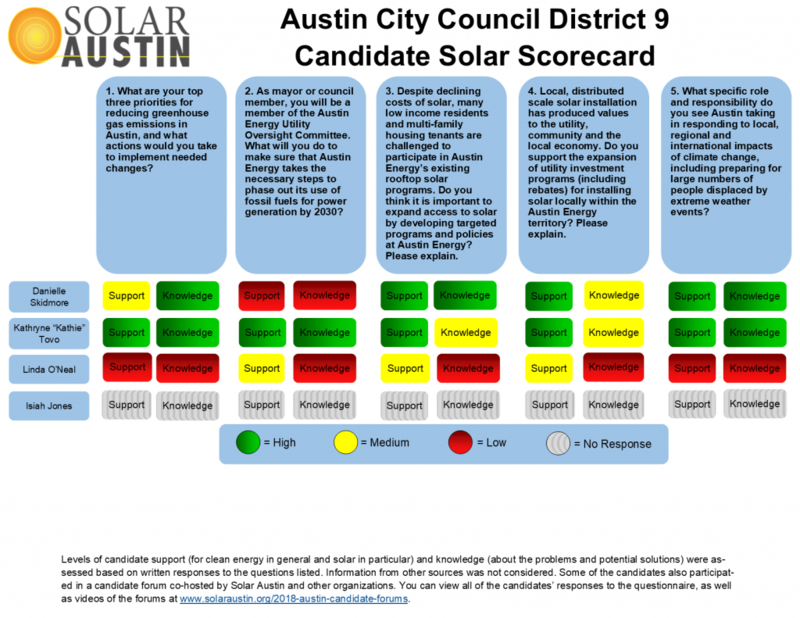 Responses from city of Austin candidates can be found here. Elections are coming up and it’s critically important that we not only vote, but that we make informed votes. 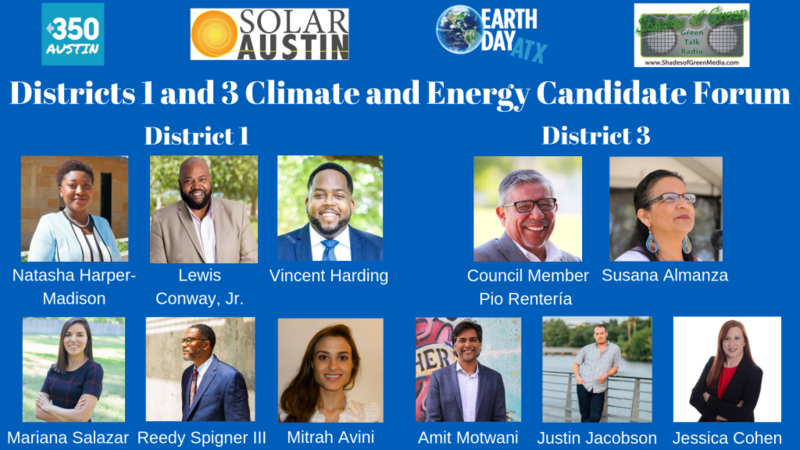 Do you know where the candidates running for Austin mayor and city council stand on important climate change and energy issues? What do they see as the problems and what solutions are they proposing? If you’re not sure, don’t worry—there’s still time to get the information you need to make an informed decision on Election Day. 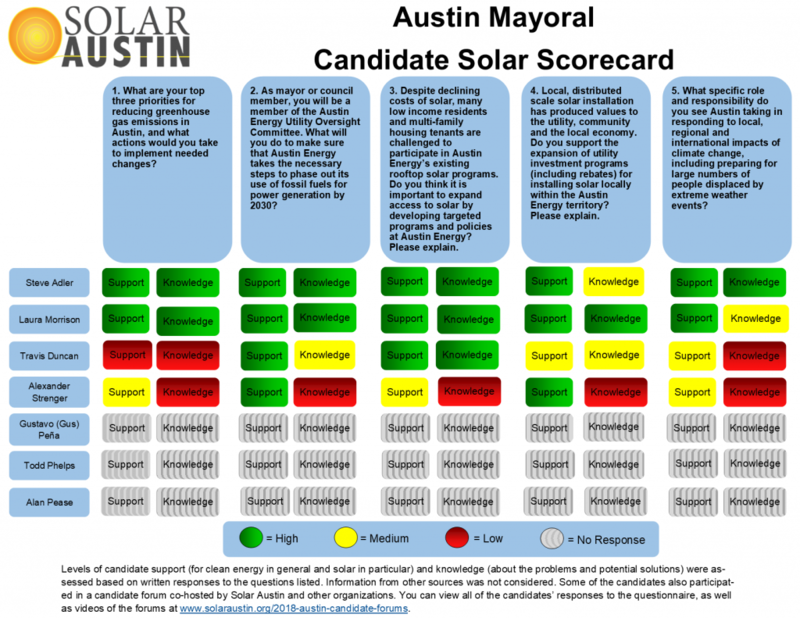 Solar Austin, 350 Austin, Earth Day Austin, and Shades of Green are hosting three candidate forums so that candidates running for Austin mayor and city council can speak to Austinites about their climate change and energy priorities. 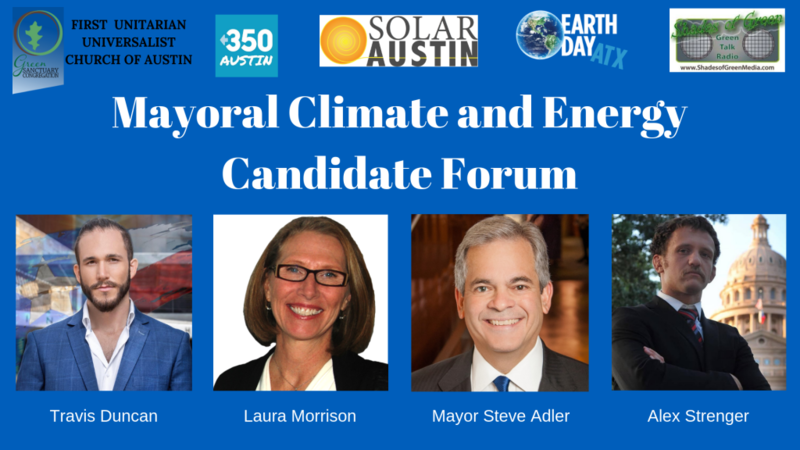 When: Tuesday, October 2nd, 6:30-9:00 p.m.
RSVP for the Mayoral Climate and Energy Candidate Forum. 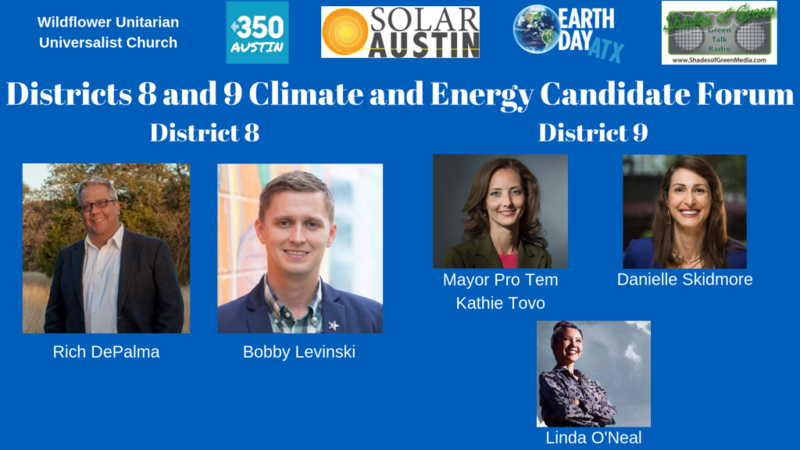 When: Tuesday, October 9th, 6:30-9:00 p.m.
RSVP for the Districts 8 and 9 Climate and Energy Candidate Forum. When: Tuesday, October 16th, 6:30-9:00 p.m.
RSVP for the Districts 1 and 3 Climate and Energy Candidate Forum. In addition to asking our questions, we will accept questions from the audience, so these will be great opportunities to ask your questions related to climate change or energy policy. We’re excited to hear from the candidates to hear what questions are on your mind. The explosive growth of renewable energy throughout the US, including here in Austin, continues thanks to technological and policy innovations such as the value of solar tariff incentive used here in Austin. Nevertheless, funding and implementing wide-scale storage of renewable energy remains a challenge, particularly for distributed energy resources (DER), such as rooftop solar. We are excited to announce that Karl Rábago, Executive Director of the Pace Energy and Climate Center (PECC), will discuss these and related renewable energy innovations as our September Happy Hour speaker. He will be joining us via Skype, but don’t worry – the rest of your Solar Austin friends will be there in person. Mr. Rábago will delve into the development of value of solar tariffs in different markets as well as its potential role in the adoption of DER storage. As the former Vice President of Distributed Energy Services at Austin Energy who led the way in creating the first value of solar tariff, Mr. Rábago will be a particularly insightful speaker on this topic. When: Tuesday, September 25th, 5:30-8:00 p.m.
Mr. Rábago is the Executive Director of the PECC, at the Pace Law School in White Plains, New York. The PECC mission is to protect the earth’s environment through solutions that transform the ways that society supplies and consumes energy. Mr. Rábago has some 25 years experience in energy and climate policy markets. 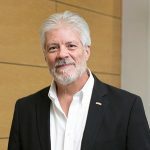 He serves as Chair of the Board of the Center for Resource Solutions, a San Francisco-based non-governmental organization that works to advance voluntary clean energy markets. 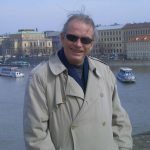 He also sits on the Board of the Interstate Renewable Energy Council (IREC). Mr. Rábago also is co-director and principal investigator for the Northeast Solar Energy Market Coalition, a US DOE SunShot Initiative Solar Market Pathways project.